"A beautiful and elegantly written book that will touch your very soul." Maggie O'Shea is grieving the loss of her husband, who has drowned in a tragic accident far from home. Her grief has crushed her passion for music, and for Maggie, a classical concert pianist, the loss of her music is unbearable. Moving on is unthinkable, until a grainy photograph draws her into a perilous search across France for her missing godson and a long-lost love. The Lost Concerto tells Maggie's story, a story of love, loss, vengeance and courage, a story of mystery and intrigue and danger. Ultimately, it is the story of a woman who must fight to move on and find what has been lost within herself. In The Lost Concerto, it is music that tells Maggie's story. A woman and her young son flee to a convent on a remote island off the Breton coast of France. Generations of seafarers have named the place Île de la Brume, or Fog Island. In a chapel high on a cliff, a tragic death occurs and a terrified child vanishes into the mist. The photograph will draw Maggie inexorably into a collision course with powerful and dangerous men, decades-old secrets, and stolen art and musical artifacts—all set against the background of Boston, Paris, and Aix-en-Provence, France. Will Maggie find the answers to her husband's death, an unexpected love—and a musical masterpiece lost for centuries? "Richly atmospheric, excellent can't-put-it-down pacing, enticing and compelling characters. Really terrific story telling. A perfect package—a stunning debut!" "Skeletons bang on closet doors, longing to be set free and free they are in this terrific mix of mystery and mayhem. Every page is fraught with danger and surprise. A true banquet for thriller readers." "If you love classical music, a challenging thriller, a twisting mystery, and complex characters, The Lost Concerto is for you. 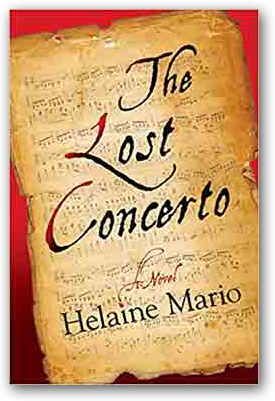 Helaine Mario proves it's never too late to write a great novel. Lushly layered, full of evocative prose and surprises, and wonderfully told, this one's a must-read. I couldn't put it down." "Simmering just below the dark and turbulent surface of The Lost Concerto is a sense of secret joy that makes it a thriller like no other. With her gift for confident, intelligent storytelling, Helaine Mario transforms the gritty subjects of murder and international terror into matters of the heart. The Lost Concerto is radiant."